Based in Big Sky, Montana, our team wants to share our love and appreciation for our backyard of Yellowstone with you. Join us for fun explorations, into the special places of Yellowstone and all of the wonders it holds. Experience the magic of these wild places. Tap into your curiosities of the natural worlds with active, hands-on adventures. Dive deep into understanding how we all are connected to this amazing place of Yellowstone. There is so much to do in Yellowstone, with so many things to discover! I see and learn something new every time I take people into the Park. I geek out on thinking about how wildlife populations change over time, and how these populations are affected by their habitats. And I love sharing what I have learned through my studies and field research in Ecology and Math & Statistics and the Socratic Method, with guests. Science is exciting, especially when you get to collect the data yourself and understand how ​it is applied in the real world. Know what else I love (besides science and Yellowstone)? Dogs, hiking, snowboarding, skiing, fly fishing and rivers! I love seeing faces full of wonder, amazement and surprise. Whether we are looking at the ever changing geysers and thermal features, or spotting a bear digging for lunch, or having lively discussions on all of the puzzle pieces that make up the Yellowstone Ecosystem; creating memorable experiences for you is my goal. For the past 30 years hiking, skiing, and learning about Yellowstone has been my passion. 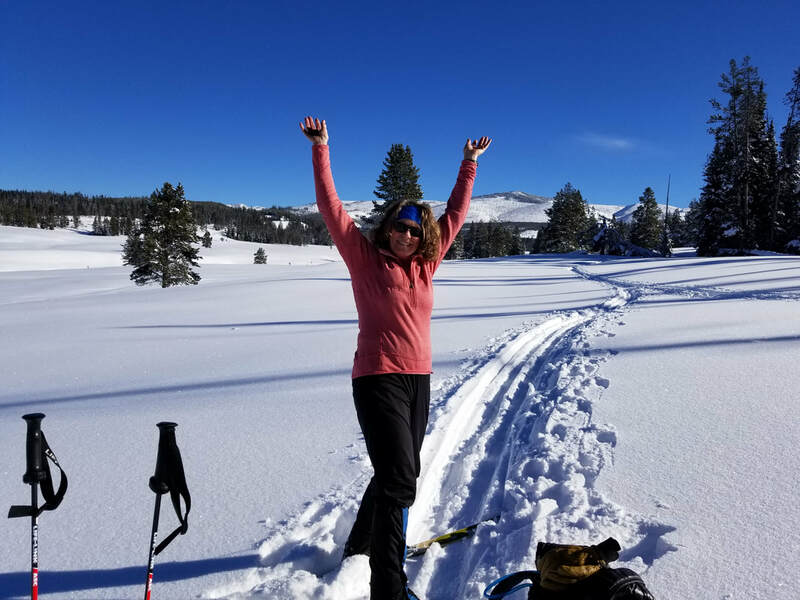 I can also be found leading Road Scholar courses for grandparents and grandchildren, leading groups for national and international dignitaries, hiking my favorite trails with my family, or cross country skiing in Yellowstone's winter wonderland. Chris is our Chris-of-all-trades! He hails from Minnesota, and spent time in the Peace Corps in Niger. He has a background in Forestry and Natural Resources from the University of Minnesota - Twin Cities and dives deep into the cultural history of this area. When he isn't out building and repairing trails, he loves hiking, snowshoeing, and skiing the trails with his wife and friends. He has also handmade his own kayak, snowshoes, and wooden cross country skis. To Chris, the wilderness is a place to play, a place to be inspired, and a place to fully immerse yourself in, especially when he is on gear he built himself! Hello! My name is Mike. One of my favorite things about Yellowstone is at any given time of the year there is something exciting happening. From the Brown Trout spawn in October to the bison calving in May, there is always excitement and adventure. When I first moved to Big Sky I was a ski and snowboard instructor, and since moved to ski patrol. Before I moved to Big Sky, I studied Zoology at Northern Michigan University. While in school I spent my summers guiding multi-day canoe trips in the Boundary Waters Canoe Area and other parts of Ontario and Manitoba. I also studied abroad in Zambia. This will be my fourth season guiding in Yellowstone National Park. I am very excited for another season and I am looking forward to sharing adventures with you! “The natural world is where we evolved. It's where our minds evolved. Working for Yellowstone and Glacier National Parks in research and education for ten years provided a wonderful foundation for her career as a teacher and guide. Since the early 1990s, Leslie has worked for a variety of travel companies and non-profit organizations, teaching classes and leading trips in national parks and wild areas throughout the American West. Farther afield, she has led trips to Nepal, Bhutan, Tanzania, Botswana, Ecuador, and Mexico. Leslie also runs a non-profit with a mission to keep kids connected to the outdoors though scholarship opportunities for outdoor learning experiences. Learning to ski in New England surely fueled my spirit to discover more mountains. It’s truly an adventure to live, work and play in an environment as stunning as the Greater Yellowstone Ecosystem. What I love most about my job is sharing my passion for this place, and watching faces light up with wonder, while experiencing something new. When we listen, the landscape and animals teach us; with new knowledge, our world expands. Come and visit with us to discover, hike, bike, ski, snowshoe, you name it! Just like the locals, you can soak up the beauty, grandeur and intrigue, to refresh and refuel your next steps. And remember that when you are planning another trip that, “Wilderness is not a luxury, but a necessity for the human spirit.’’ For me, it’s a celebration! without feeling overwhelmed? Try this itinerary!